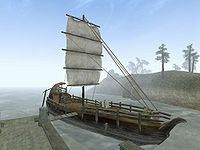 The Chun-Ook is the ship of Nevosi Hlan at the docks in Ebonheart. The Chun-Ook can take you to Hla Oad, Sadrith Mora, Tel Branora, or Vivec. The crates and barrels on deck contain some sundries and ingredients. The locked Cabin contains a chest with drinks, a Servant's skull, a locked chest with gold, and some vintage brandy on a shelf. The door to the Upper Level is locked. The cargo hold is guarded by two Imperial Guards and contains the book 2920, First Seed which raises your Spear skill, sundries, and ingredients. Two sacks and three chests hold moon sugar. The lower level is locked as well and contains limeware and silver dishes, the target of a quest. This page was last modified on 8 September 2018, at 03:48.